I was a strict vegetarian for over a decade, quite recently too, and still eat mostly meat-free meals. So why did I draw a complete blank when I thought about food to make for a vegan house guest? It’s not that I relied so heavily on dairy or eggs for my dinners back then so it shouldn’t have been hard. It probably goes to show how hard it is to think outside your own box even if you’re in the business of thinking about a particular thing all the time. I actually had a hard time planning a week of vegan meals even though I think about vegetarian meals all the time. A summertime vegan menu–for the week! Grilling–and why not? Rice made the night before gets a quick fry with curry leaves and chilies (in oil instead of butter) to become spiced, tempered rice. We’ll eat it with grilled vegetables and blackened tofu skewers that have taken a dip in a porcini spice blend. Antipasto special. I’m letting the fantastic specialty purveyors around us help with this one. Marinated mushrooms, preserved eggplant, great olive oil and a variety of mixed olives, fresh bread, like a standout red fife sourdough made within hours. And I’ll whip up some hummous and chilies in oil while my guests open the wine. Tacos. Duh. Warm corn tortillas with cumin and chipotle spice-fried black beans, the best guacamole ever (recipe to come if I win the contest! yes, an actual contest this summer among my friends…and I will take them down!) and maybe a strawberry salsa which you haaaave to try. Herb soup that’s perfect warm or chilled, topped with eggplant bacon and served with grilled pan con tomate (garlic and tomato-rubbed toast). But first up, a light dinner in on the night they arrive, pictured above. 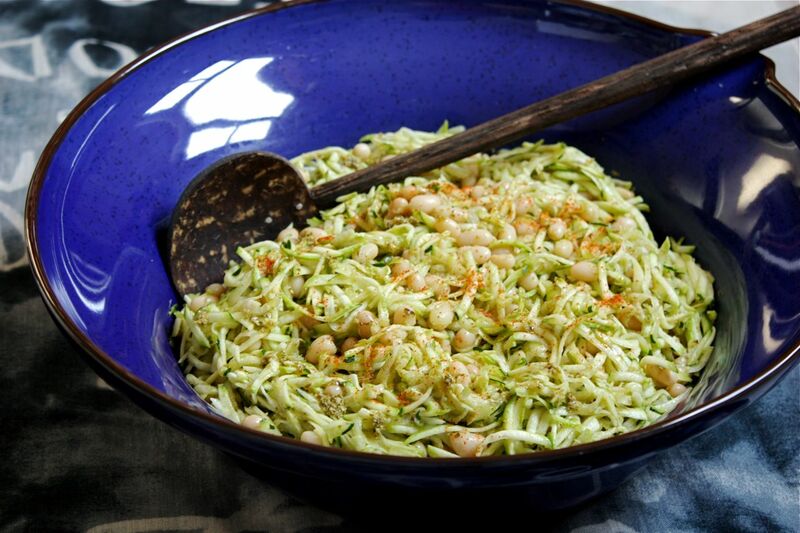 Shredded zucchini, tossed with pesto (Parmesan-free, of course…add a few pitted green olives for oomph), white beans and cayenne pepper. Surprisingly satisfying. Vegan, raw, gluten-free…I inadvertently created a dish for everyone except people allergic to healthy. There will be a night to two or even more that we will be out so I planned for the “weeknights” only but really could have gone on. I didn’t even get into vegan-friendly Sri Lankan or Japanese meal ideas, for instance. I tried to figure out why it was hard to start when after a while the ideas started to roll. It was a matter of moving the focus from thinking of the big show-stopper in the middle of the table to finding inspiration in the theme, or highlighting a cuisine or a flavours. Finding a simple but special starting point and layering on good accoutrements. Those of you who are already vegan cooks, I hope you stand up for yourselves when people so much as raise an eyebrow to you. I always hated when people assumed my vegetarian meals were boring, when I think it takes more creativity to plan a meal that doesn’t have meat at the centre of it. Kudos to you and your (superior) delicious dinners every week.